My ping got terribad fast. My connection always seems to do this around midnight; that's if it doesn't drop altogether. Fibre is almost overrated if you just do regular internet surfing, a simple low internet plan should work completely fine for web browsing. But, if you can't find the ping issue yourself I'd ask your ISP for some help, and if it really becomes and issue then just switch companies(if you can). Edit: just noticed your youtube channel in your sig, if you put out videos often fibre might actually be worth it. But a lot of places have bad pricing for fibre, you should do a bit of research and see what you can find. I love my Fiber Gigabit. I had fibre before I moved house, and it was a godsend. Our town just recently got fibre, and at the same time ADSLs got upgraded from the usual 8m down and whatever it is up, 0.3m I think to 20+ down and 1 or 2 up. I moved into a house share and went back down to ADSL and it's noticeable, even for web browsing on a fast computer. My Macbook Air just feels strangled on our speeds. I house share, but I will possibly end up taking out fibre and footing the bill for myself. The problem around here is the cables are ancient, although BT are replacing a fair bit of it I have been told there's still a lot of old aluminium (not even copper) cables from way back in the day. Old cables can be a nightmare, i have that problem here. ADSL is borderline unusable now, maximum speed is about 8 mbit and that still drops out completely. Luckily the coax tv cables are decent and i still get something like 100 mbit down, 15 mbit up (plan is for 150 mbit down, but wifi can be the bottleneck there, i've measured speeds over using a hard connection). Currently it seems the backbone is having some problems though, at busy times (say 19:00 to 22:00) downstream sometimes bogs down quite badly - guess a lot of people are watching netflix and such. 10k as in 10k milliseconds? Or 10 seconds? 1 year of latency data for 8.8.8.8 (Google public DNS). 1 day average. Site-to-Site VPN to work - office is about 1km from home as the crow flies, probably less. Latency in town is dreadful. Yea, it's 10k miliseconds = 10 seconds. Christ. Is the latency on satellite even that bad?! No, we have a lot of sites running satellite here, 600msec is typical for satellite. I know you can set the timeout higher, but i've never actually used that option. 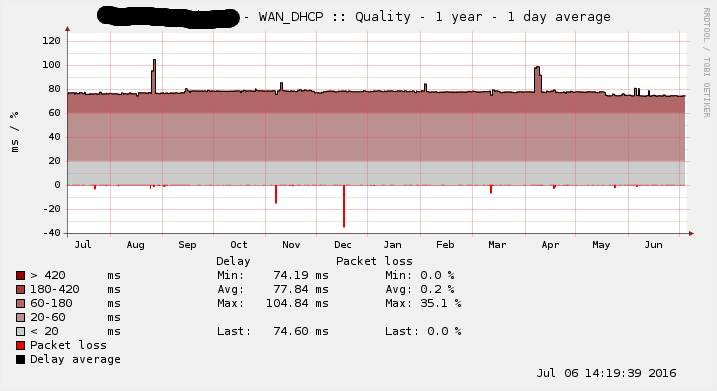 This must really be a last-mile problem though, i can ping servers in indonesia from holland with pings of 200-250 ms. Considering that's over 12000 km of sea cables per direction it's not too shabby at all! Yeah, you can set that timeout - and much more! -f Set Don't Fragment flag in packet (IPv4-only). -r count Record route for count hops (IPv4-only). -s count Timestamp for count hops (IPv4-only). -k host-list Strict source route along host-list (IPv4-only). -R Use routing header to test reverse route also (IPv6-only). -p Ping a Hyper-V Network Virtualization provider address. Sure you can, but it's interesting that some people actually need to increase the timeout value to get usable results. Then again this is indonesia... where your mobile connection can be way faster than your landline both in ping and throughput. I love the country, but at times internet connections will drive you mad down there. Upside is that mobile networks keep rolling out at a fast pace, and with landlines lagging this far behind in many places using a mobile connection is preferable, as long as you don't use much data traffic. Then again this is indonesia... where your mobile connection can be way faster than your landline both in ping and throughput. The usual/daily usage (for internet, etc) is about 50ms - 200ms. I've noticed that this is mostly the place in somewhat remote locations, though i guess certain parts of cities could suffer from it too. There have been numerous situations where the wifi in a hotel was strong but the connection barely useable, while 3g connection was fine. If you use a lot of data this will not be a real solution, but for the occasional email, fb post or forum check prepaid telkomsel served me well. When in indonesia i usually just get a telkomsel sim with 3 gb of data for 100k or so - it's quite nice to have affordable data plans like that!